(3/14/08) Point Lookout, Mo. – Grace College (Ind.) became the first un-seeded team to reach the elite-eight with a 90-81 overtime victory over third-seeded Morningside College (Iowa) at the 2008 NAIA Division II Men’s Basketball National Championship. The 17th-annual event is being held at the Keeter Gymnasium on the campus of the College of the Ozarks (Mo.). 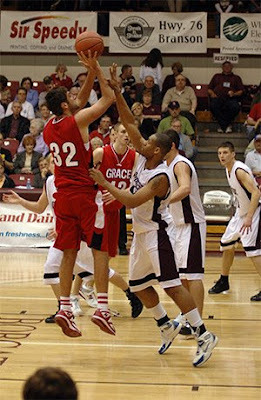 Grace College (Ind. ), now 26-9 overall, advances to play the winner of #6 Evangel University and #11 Oregon Tech (9:30 p.m.) Saturday in the Elite-Eight at 8 p.m. The 32-team, single-elimination tournament concludes on Tuesday, March 18.